As I work through my pile of shame, I've decided to work on my Father's Day gifts first. I've recently finished Gabriel Knight: Sins of the Fathers 20th Anniversary Edition (expect a review on this soon) and once that was out of the way I started playing Valkyria Chronicles, the second gift I received on Father's Day :). I don't usually go for JRPGs which Valkyria Chronicles bears some resemblance to but the gameplay is different to your average JRPG and I couldn't go past the setting since it looks like a game set in WWII. If you thought the same, then you'd be half-right. After about 7 hours playing the game, here are my initial thoughts. It's the WWII European theatre but not as we know it, not as we know it, not as we know it...: For all intents and purposes, you're basically fighting in Europe during WWII except the names have been changed to protect the innocent (or something). The Eastern Europan Empire are basically the Axis powers and the Federation, the Allies. Your nation of Gallia seems to be a cross between Switzerland and the Netherlands: a small, wealthy nation that has universal conscription in order to bolster its ranks. Comic book style visuals: The game has adopted comic book style visuals with frequent use of onomatopoeia to emphasise sound effects such as the rumbling of a tank. Role-playing elements: Along with the turn-based tactics there are role-playing elements too. Gaining experience in battle is used to level up your troops and also purchase better weapons and equipment. A big thumbs up from me! Squad management: A bit like Jagged Alliance each of the grunts under your command actually have their own personalities. Not only does that come across in their demeanour during battle but they also have different perks depending on the situation as well as liking different members of the team (which in turn confers a bonus). It's turn-based yet not: While I like the turn-based tactics element of the game overall there is one thing that really annoys me and that's the fact that if enemies are nearby they fire in real-time. i.e. if you take your turn too long you can find yourself dead after they've taken a few potshots at you. So make sure you decide what you're going to do on the map screen before you select a character. Fiddly console controls: You'll be using the keyboard to navigate through menus which is annoying, especially when I manage to press the wrong keys by accident. It's also so frustrating when you can see tabs on a book to click or pages to turn using a mouse but you have to use the keyboard instead to do it (which usually takes longer). The scriptwriting: To be honest, I'm not too surprised about the poor scriptwriting - at least that's been my experience with several Japanese games; the plot always seems to turn into a melodrama filled with caricatures and old-fashioned stereotypes. Line of sight is hard to gauge: There's been a few times where I've frustratingly wasted command points because I seemed to have line of sight when in fact there was an invisible wall or something else blocking the path of the projectile, despite an information box showing you're actually targeting something. It also doesn't help that the information box doesn't actually tell you what that something is. Lots of cutscenes: While I'm not one to usually complain about cutscenes, there are quite a few in Valkyria Chronicles, in fact probably half the game contains cutscenes. 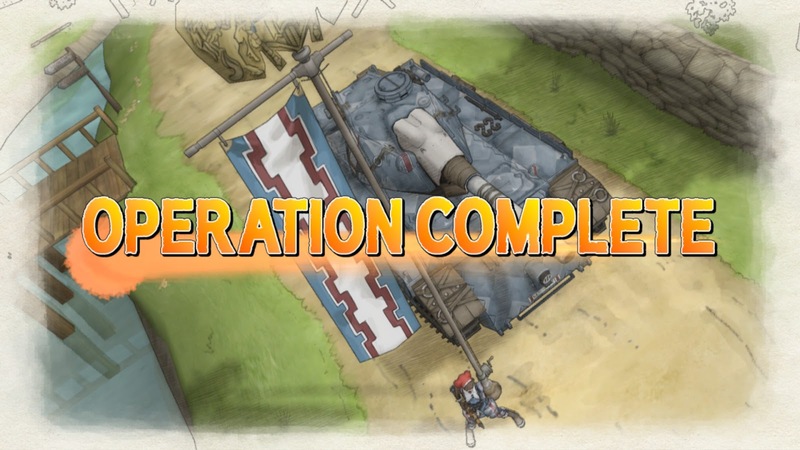 I must admit that I'm hooked with Valkyria Chronicles but I don't know why. Maybe it's because this is quite possibly the first role-playing game I've played in a WWII setting, even if turn-based tactics makes up the core of the game. Or maybe the poorly written cutscenes is like watching a train wreck. Either way, I'll be giving this game my best shot and fingers crossed I'll finish it and be able to give you guys a review.